The European Parliament elections: Trouble in paradise for Austria’s right-wing government? The upcoming European Parliament elections represent the first nation-wide test for Austria’s right-wing coalition government. Manès Weisskircher provides an overview of the election in the country, where there is the potential for tensions to emerge within the government camp. So far, this picture of stable majoritarian support has, by and large, found confirmation in national poll numbers and subnational elections. But the European Parliament elections on 26 May will represent the first nation-wide electoral test of the Austrian government’s popularity and stability: importantly, some observers expect tensions within the government camp. The ÖVP’s lead candidate, Othmar Karas, is an ‘EU enthusiast’, and perceives himself to be the ‘main enemy’ of the FPÖ’s front runner, Harald Vilimsky. The latter is an ‘EU sceptic’ who has already rhetorically ‘thrown down the gauntlet in the face’ of Karas. So far, the coalition parties have managed to avoid stark public conflicts. Could the upcoming election therefore produce some trouble in paradise for the government and give a boost to opposition parties? 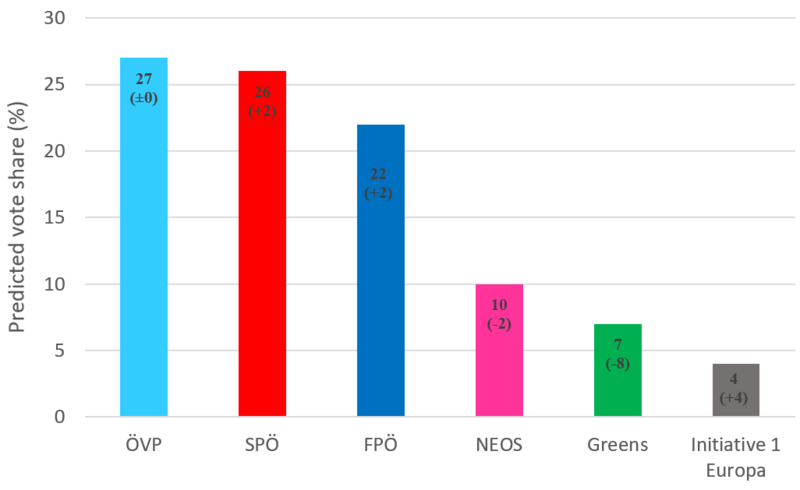 Early polls predict a close race, with the ÖVP, FPÖ, and the social democrats (SPÖ) both in touching distance of first place, all close to their 2014 numbers. The liberal party NEOS could make some gains, while the Greens may suffer substantial losses as they face a challenge from the renegade Green ‘Initiative 1 Europa’. The ÖVP’s Karas, who has been an MEP since 1999, embodies the EU mainstream: he is equipped with the charisma of a textbook technocrat, and has traditionally expressed strong support for core EU policies. In the last two elections this has worked wonders, with Karas gaining the most preference votes of any candidate. One of the few remaining vocal conservative critics of some ÖVP-FPÖ government actions, he has been popular among liberal sympathisers, but less so among key ÖVP politicians surrounding chancellor Kurz. In the past, Karas publicly criticised the governments’ rejection of the Global Compact for Migration, as well as the adjustment of child benefit payments for Austrian-based workers to their children’s place of residence, lowering disposable income for many Eastern European citizens. Correspondingly, reports of Kurz planning to replace Karas with a more aligned politician were certainly not unfounded. However, this was never a realistic option: Karas’ likely response of running independently would have destroyed the ÖVP’s chances of becoming the strongest party in the EP elections for the third time in a row. As a solution, Kurz prominently placed Karoline Edtstadler in second place on the ÖVP list. She is expected to copy Kurz’s winning formula from the 2017 election, i.e. restrictive stances on immigration and integration. When asked about whether Karas or Kurz will be her ‘boss in the campaign,’ Edtstadler’s answer was imprecise and at the same time very precise: ‘I stand for strict [konsequent] migration policies’. Will Karas go along with such an anti-immigration focus or will there be visible disunity between conservatives over the issue? The FPÖ’s Vilimsky is an experienced politician with few notable moments in Austrian politics. Most memorably, a decade ago he promoted the utility of Taser weapons for the Austrian police by demonstrating their alleged usefulness – on himself. Last year Vilimsky made headlines after accusing Jean-Claude Juncker of alcoholism – an accusation that Karas found ‘unworthy for a governing party’. Vilimsky’s greatest electoral asset is his status as the most visible opponent of the EU mainstream. Therefore, he will focus on criticising Karas, in his words an ‘EU priest’, rather than Edtstadler. He has already condemned Karas’ rejection of government policies. The FPÖ’s leader, Heinz-Christian Strache, vice-chancellor of Austria, has recently indicated that he would not support Karas’ nomination as EU commissioner. Karas will strike back by accusing Vilimsky of associating himself with alleged ‘anti-Europeans’ such as Marine Le Pen and Matteo Salvini and the push for Öxit – i.e. Austria’s withdrawal from the EU. However, Vilimsky will in all likelihood shy away from adopting such a radical position, in line with other radical right parties in Europe that have recently turned out to be ‘not so eager to leave‘. The opposition parties will, on the one hand, relish visible tensions among and within the governing parties. On the other hand, they may fear that government disharmony may steal badly needed attention away from their own campaign. The social democrats have nominated Andreas Schieder as their leading candidate, but only after short-term chancellor Christian Kern (2016-2017) revoked his candidacy. Last year, Schieder lost a decisive intra-party vote that would have allowed him to become Vienna’s new mayor, while shortly afterwards he was also removed from his position as leader of the SPÖ parliamentary group. Visibly unhappy about these developments, he was soon compensated with first place on his party’s EP list. Perhaps not the best preconditions for a successful campaign. However, the SPÖ may benefit from turmoil within its Green competition. Austria’s Greens, once Europe’s most successful Green party, were voted out of parliament in 2017. After this shock, many Greens had high hopes for the EP election, longing for a comeback on the national scene. However, like 2017, a renegade green politician may rain on their parade: long-term MEP Johannes Voggenhuber (1995-2009) will be running under the label ‘Initiative 1 Europa’. The worst case scenario for the Greens is that both parties fail to reach the four to five percent required to gain a seat in the Parliament. The liberal NEOS might take advantage of this situation. The figurehead for their campaign, Claudia Gamon, is the only woman among the main parties’ leading candidates. An expected good showing will further establish the liberals on the political scene – a political force that has for a long-time been absent in Austrian politics. Currently, almost 40 percent of Austrians regard immigration as one of the two ‘most important issues facing the EU at the moment’ – by far the most frequent response. Certainly, immigration will play a strong role in the campaign. The issue has already shaped Austrian public debate on the EU in the past, especially over the course of the Eastern enlargement. Since 2015, the ‘refugee crisis’ has become the dominant issue in Austrian politics. The ‘protection’ of external EU borders was also a focus of Austria’s Presidency of the EU Council in the second half of 2018. A major challenge for the opposition parties will be to increase the salience of their own core issues. Should they remain unable to do so, the government’s challengers will have difficulties gaining voters from the governing parties – or mobilising some of the usually more than 50 percent of non-voters. Successfully campaigning on EU social policies, for example, will become difficult not only due to the absence of any short-term hope for the social democratisation of EU politics, but also because ‘the state of member states public finances’ is, in the eyes of the Austrians, the second most important EU challenge. The direct consequences of the EP election in Austria for the future of European politics will be modest. Apart from the limited influence of the EP on key issues such as Eurozone politics and immigration, the numbers are clear: in the case of Brexit, Austria will provide 19 of the EP’s 705 members, or 2.7 percent. Small gains and losses of individual Austrian parties will therefore hardly matter for the composition of the EP. The most interesting aspect of the Austrian vote is its implication for understanding national politics and similar developments elsewhere. The EP election raises the questions about the stability of what many call ‘populist’ governments. Potential frictions between the ÖVP and FPÖ revolve around immigration and integration, where both increasingly compete for similar voters, and EU integration, where, luckily for both parties, no urgent divisive decisions such as treaty revisions are due. Both issues could make cooperation more difficult in the long run. However, should early polls be confirmed and both governing parties remain stable or even improve at the ballot in comparison to 2014, tensions are unlikely to be too serious for now. Chancellor Kurz and vice-chancellor Strache will be able to downplay any nasty exchanges between their MEPs as long as there is no electoral harm done. What is more, they might even welcome a strategic constellation that puts their parties’ campaigns in the spotlight. In a political climate where immigration continues to be highly salient, their competitors have only three months left to set the agenda and cause trouble in paradise.